WE HATE TO be the bringers of bad news, but the weather is not looking great this weekend. 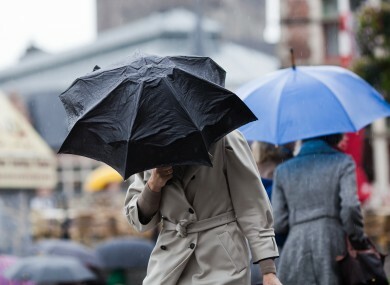 Met Éireann says this morning will be cloudy and breezy with outbreaks of rain and drizzle. On a more positive note, drier conditions and a few showers will follow from the west through the afternoon and early evening. Highest temperatures will range from eight to ten degrees Celsius, with moderate to fresh winds as rain and drizzle gradually clear. Much of tonight will be dry in many areas. However, there’ll be some showers in north Ulster and some drizzle in the southwest. More persistent rain will spread from the west overnight and will extend to all areas by morning. It will be breezy with moderate to fresh westerly winds and lowest temperatures of three to seven degrees. Tomorrow will be dull and breezy with rain in all areas. The rain will be persistent at times. Towards evening, it will mainly affect Munster and south Leinster and will become patchy further north. Highest temperatures will range from seven to nine degrees for the northern half of the country and ten to 12 degrees further south. There will be moderate to fresh westerly winds. Over the weekend there’ll be persistent rain in some areas. It’ll be cold in the north, but milder in the south. Scattered blustery showers will die out on Saturday evening with drier clearer weather developing for a time. There’ll also be frost in certain areas. Later in the night, cloud will increase with scattered outbreaks of rain pushing in from the Atlantic. Lowest temperatures will range from three to six degrees Celsius. A frontal band of rain is likely to stall across the country, bringing persistent falls of rain to many areas, with spot flooding possible across the central belt of the country. Southern counties may see small amounts of rain, with the chance of some sunny spells in the far north – it’ll be coldest here though. Highest temperatures will range five to 13 degrees Celsius, with moderate to fresh westerly breezes. Monday will be cold, kicking off with frost and ice. There’ll be sunny spells and scattered wintry showers, reverting back to rain from the late morning. Highest temperatures will range from five to eight degrees Celsius, but it’ll feel colder with an added wind chill effect, owing to a brisk northwest wind. Email “Have plans this weekend? There'll be persistent rain in many areas”. Feedback on “Have plans this weekend? There'll be persistent rain in many areas”.